A larger-than-life bronze statue of comedian Les Dawson has been unveiled by his widow and daughter in his home town in Lancashire. The statue stands in the ornamental gardens next to St Annes Pier in Lytham St Annes. Tracy, who was with daughter Charlotte at the unveiling, said the statue had been "a dream for the past 12 years". Sculptor Graham Ibbeson said: "Les Dawson is back on stage - and back on stage in the town he loved." 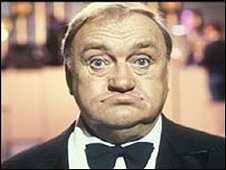 "In this portrait what I've tried to do is put in all the affection I have for Les Dawson and all the affection he had for the people of Britain," Mr Ibbeson said. Dawson, who died in 1993, regularly poked fun at the resort in his routines. In one he famously said: "I live in Lytham St Annes where it's so posh that when we eat cod and chips we wear a yachting cap". A "garden of fame" will also be created by the statue to highlight celebrities past and present who have made a contribution to the history and community in the Fylde. Councillor Simon Renwick, from Fylde Borough Council, said: "We feel that the 'sunken gardens' is a perfect place for the statue, and will provide a perfect home for a tribute to the local comedy legend. "We expect the statue to be a major tourist attraction that will draw people into the heart of St Annes and boost the regeneration of the whole area. "In the longer term we would like to develop the garden around the statue as a peace and sensory garden, which we think will add to the classic resort status of St Annes and complement the statue and the other tributes to local celebrities". Tracy Dawson, Les's widow, said: "The statue is larger than life, just like Les, and it captures his personality perfectly, right down to the twinkle in his eye. "Although Les was short in stature his impact on the Fylde coast was phenomenal and the statue will provide a lasting legacy in his name." The unveiling ceremony was screened live on the BBC One's The One Show on Thursday.